Please, don’t say “I didn’t have time”. Instead say “I didn’t make time”. The change in the way you think about your time and weather you have it or you make it is huge. It changes they way you prioritize the thing you want to spend your time on. When you think about making time for things you plan to do the things you need and want to do. The other things will work out. Those commitments and the things that have to get done will get done. But, you need to make sure to plan for the things that are important to you. This story from Stephen Covey’s First Things First habit is a great illustration of making time. One day this expert was speaking to a group of business students and, to drive home a point, used an illustration I’m sure those students will never forget. After I share it with you, you’ll never forget it either. As this man stood in front of the group of high-powered over-achievers he said, “Okay, time for a quiz.” Then he pulled out a one-gallon, wide-mouthed mason jar and set it on a table in front of him. Then he produced about a dozen fist-sized rocks and carefully placed them, one at a time, into the jar. When the jar was filled to the top and no more rocks would fit inside, he asked, “Is this jar full?” Everyone in the class said, “Yes.” Then he said, “Really?” He reached under the table and pulled out a bucket of gravel. Then he dumped some gravel in and shook the jar causing pieces of gravel to work themselves down into the spaces between the big rocks. 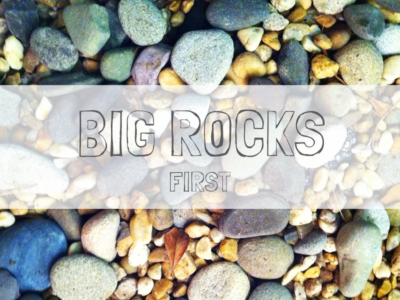 What are the big rocks in your life? A project that you want to accomplish? Time with your loved ones? Your faith, your education, your finances? A cause? Teaching or mentoring others? Remember to put these Big Rocks in first or you’ll never get them in at all. Make sure you’re creating the right priorities for your family and your life. In other words make the time for the important things.